We've all seen the commercials for laundry boosters that promise to whiten our whites and remove our toughest stains, but guess what? You don't need them. 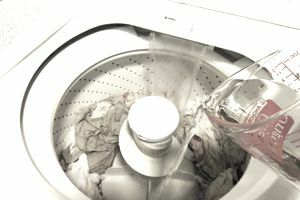 For a frugal laundry booster (and we're talking pennies a load frugal), just add a cup of white vinegar to your washer's rinse cycle. It's one solution that's as simple as it is effective. The acetic acid in vinegar acts as a solvent and as a disinfectant – just what you need to fight your toughest laundry challenges. And unlike other laundry add-ins, it won't leave any residue behind on your washing machine or your clothes. One bottle of vinegar can take the place of a whole host of laundry products. Use it to remove stains, as a replacement for store-bought fabric softener, to clean wool clothing and to remove that persistent mildew smell from front-loader washing machines. Then, when you get done testing all the things vinegar can do in the laundry room, explore all of its other household uses. You'll be amazed at how many commercial cleaning products vinegar can take the place of. Trying to Green Up Your Laundry Routine? Switching to homemade laundry products is a great first step. Cutting your dryer use is another. Use this formula to determine how much it's costing you to run your dryer. Then, find ways to cut that cost and all of the kilowatt hours that you're using. Dryer balls are one option. They speed up drying time, so your dryer doesn't have to run as long. And cleaning your dryer vent twice a year can go a long way towards further speeding up drying times. If you have space, line-drying clothes outside or inside can make a huge dent in your energy use. If you've tried line-drying before and run into problems, check out these suggestions, and give it one more try before you write it off entirely.